This article was written By John Berra on 30 Mar 2016, and is filed under Features. 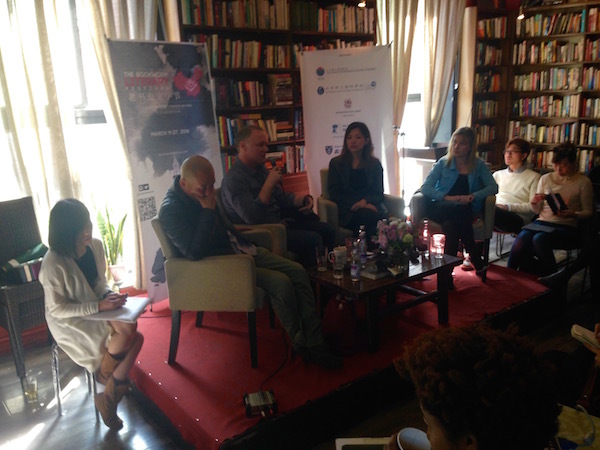 2016 marked the 10th anniversary of the Bookworm Literary Festival, an event that constitutes a vital cultural intersection for the city’s arts scene. Although a passion for literature is still very much the heart of the festival, its program now encompasses a wide range of topics as a means of providing a platform for discussion that attracts participants and attendees from a myriad of communities. Building on the expanded focus of 2015, this year’s proceedings included more media panels, performances, workshops, and a China Future Perfect series that aimed to identify and interrogate a range of issues that are pertinent to contemporary Chinese society. While such ambitious widening of scope could risk inducing the early onset of festival fatigue or even the distortion of the event’s core aims, the thoughtful scheduling of events facilitated a healthy dialogue across panels which served to illustrate how a multitude of methodologies are being used to address China’s rapid social changes and their global political implications. This is not to say that the Bookworm Literary Festival is at all heavy going: the event is as relaxed as it is well-organized with most panels buoyed by a healthy sense of humor as even the most serious minded guests found moments of levity in unlikely subjects. 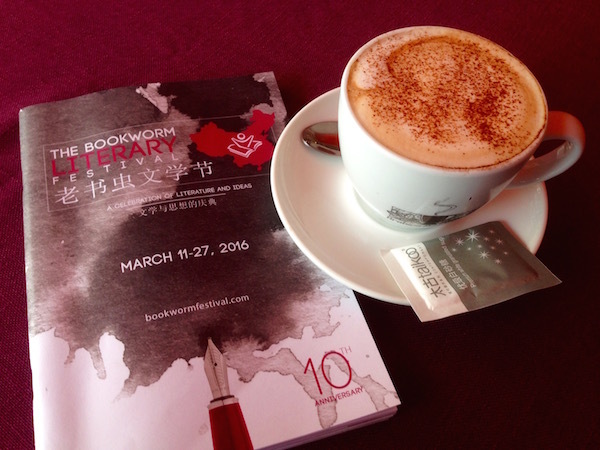 If a general overarching effort defines the Bookworm Literary Festival, then it is arguably the pressing need to make sense of China on some level, whether as it is individually experienced, or as a power that exerts considerable influence on other societies in East Asia and beyond. This series of reports will group together coverage of related panels to highlight some of the debates raised by this year’s festival, starting with its strand on film and digital media. Chinese Filmmaking: From the Indies to Hollywood found former Los Angeles Times film editor Julie Makinen, festival organizer and independent filmmaker Jenny Man Wu, and documentarian Bai Budan discussing the current state of China’s movie market, which s now the second largest in the world. Moderated by Clifford Coonan, longtime Asia correspondent for The Irish Times and The Hollywood Reporter, the number of topics covered by this panel illustrated how Mainland China cinema remains extremely segmented with a relative lack of crossover between art-house and mainstream sensibilities preventing it from the achieving the world class status it constantly seems on the verge of, not to mention the international box office returns desired by local studios. 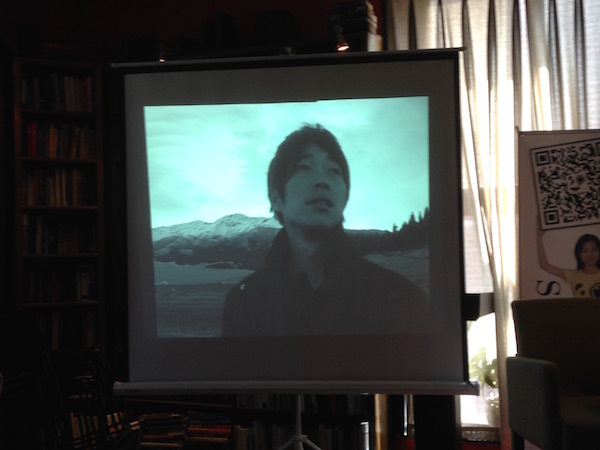 The contemplative clips shown from Bai’s earthy documentaries Little Feet (2006) and Red Paradise (2010) are characteristic of a cinema of low-profile social engagement that exists in opposition to the crowd-pleasing escapism of such recent hits as Monster Hunt (2015) and The Mermaid (2016). Coonan described the current mainstream scene as a “fractured market in transition” with the breakneck pace of development and the considerable sums of money being thrown at creating local blockbusters resulting in an industry culture that crucially fails to fully develop talent or ideas. Makinen positioned the import quota system as an issue on the basis that the number of slots reserved for major Hollywood blockbusters in the 3D format entails that audiences in China do not receive sufficient exposure to more cultivated mid-range films. Wu, however, was optimistic about the future of both Mainland China cinema and its audience, asserting that the tastes of cinemagoers in second and third-tier cities will become more eclectic over time. The success of Diao Yi’nan’s award-winning noir Black Coal, Thin Ice (2014) was cited as an encouraging sign, although there has been little ripple effect from its popularity since its release two years ago. As Makinen suggested, the future of China’s mainstream cinema largely depends on film school graduates with “a foot in both worlds” who, having studied in China and the United States, may develop projects with truly global appeal. 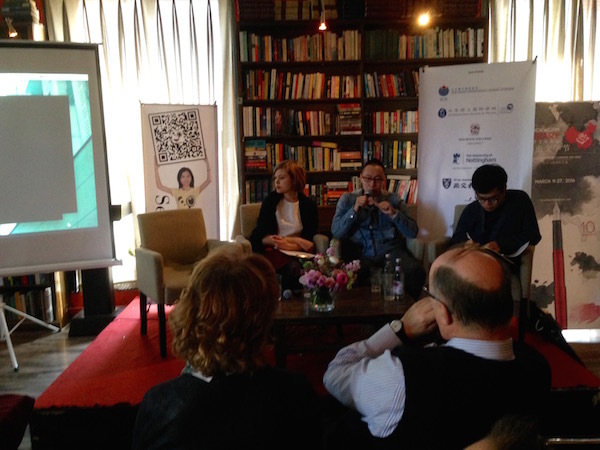 At the film panel, Bai bemoaned the lack of a good documentary environment in China as censorship restrictions and limited exhibition opportunities prevent such filmmakers from showing audiences what they see in the world around them. However, the more experimentally orientated The Arts Alive: Identity and New Media in Contemporary Chinese Art showcased the work of two artists who were managing to find outlets for their takes on a society in transition. 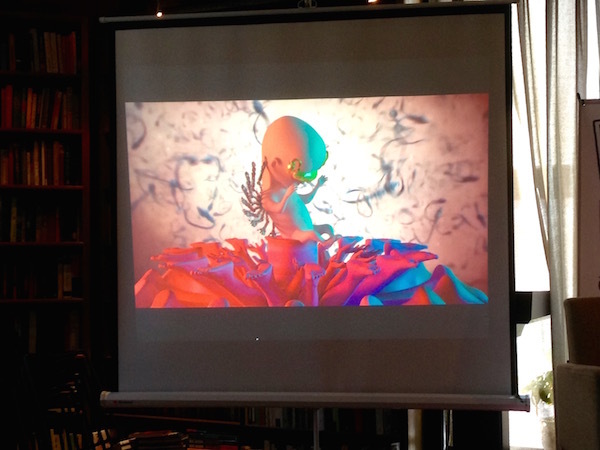 In-keeping with the multi-media theme, director Ju Anqi joined the panel via WeChat to talk about his documentary Poet on a Business Trip (2014) while digital artist Tian Xiaolei was present to show his animated shorts The Poem (2014) and The Creation (2015). A graduate of the Beijing Film Academy, Ju is the more traditional of the two but his work evidences a fiercely underground aesthetic and rough-hewn production method – the black-and-white Poet on a Business Trip was shot over 40 days in Xinjiang with poet Hou Xianbo playing himself as he wrestles with political disfranchisement and sexual desire while travelling around the region. The director embarked on the project to achieve a better understanding of the troubled yet beautiful province that he had previously explored as a youth by riding around in the back of a truck. Its landscape enabled Ju to convey his philosophy of life’s extremes as Hou is caught between natural splendor and the yearnings of the body, with the latter represented by the copious prostitutes that the poet visits throughout his journey. As with most of China’s independent filmmakers, Ju’s work has been little seen at home because of censorship restrictions but applauded on the international festival circuit. Tian’s motivation is also to make sense of the surrounding world, albeit through the virtual spaces in which he seems to feel more at home. A self-described ‘zhai nan’ (someone who prefers to stay at home and spends most of their time living through screens) Tian has made a series of videos that explore the theme of how technology will affect human evolution. Whereas the defiantly raw Poet on a Business Trip goes back to nature, the multi-layered imagery of Tian’s shorts show how far removed we are from it and speculate on what our daily life will be like in the future. Tian was keen to distance himself from politics, jokingly describing himself as “a good citizen” and stating that today’s world is a “comfortable place”. The thematic scope of his works – cultural fusions and religious elements jostle for attention alongside man’s quest to achieve a ‘super reality’ in which technology radically extends the average lifespan – evidences a fascination with how virtual spaces can remix existing experiences and traditions to create new ways of life. While he does not see a problem with the fact that most people now spend half the day using screens, Tian did concede that he was not able to have a “personal conversation” with his work until the advent of 3D printing made it possible for him to touch his sculptures. When pressed about commercial realities facing those who strive for personal expression, Tian revealed himself to be as much an entrepreneur as an artist, explaining that he accepts commissions and is even planning his own line of jewellery. Still, his preferred method of planning videos by making necklaces inspired by his ‘scattered thoughts’ with each bead representing a space to be explored suggests that his fashion line could be a unique hybrid of art and commerce.